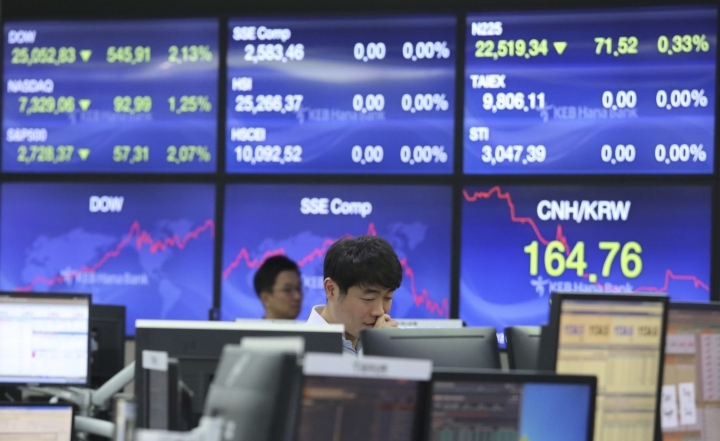 SINGAPORE — Global stock indexes rose Friday after their recent sharp declines on hopes that U.S. President Donald Trump and his Chinese counterpart, Xi Jinping, will meet at the Group of 20 summit next month. The Wall Street Journal reported that the White House had informed officials in Beijing that it would go ahead with a meeting in Argentina. It cited unidentified sources from both sides. The aim was to find a way out of the impasse over trade that has led both countries to impose penalty tariffs on billions of dollars of each other's products. Chinese foreign ministry spokesman Lu Kang offered no specifics beyond saying the country was in "communication" with the U.S at "all levels." Strong Chinese export data also breathed life into stock markets that have fallen in recent days. Across-the-board selling, spurred by rising interest rates and trade tensions, had rocked Wall Street and rattled traders in Europe and Asia. Markets are still "not out of the weeds" despite a "semblance of sanity returning," said analyst Stephen Innes of trading platform OANDA. France's CAC 40 was up 0.6 percent to 5,139 while the DAX in Germany added 0.5 percent to 11,602. 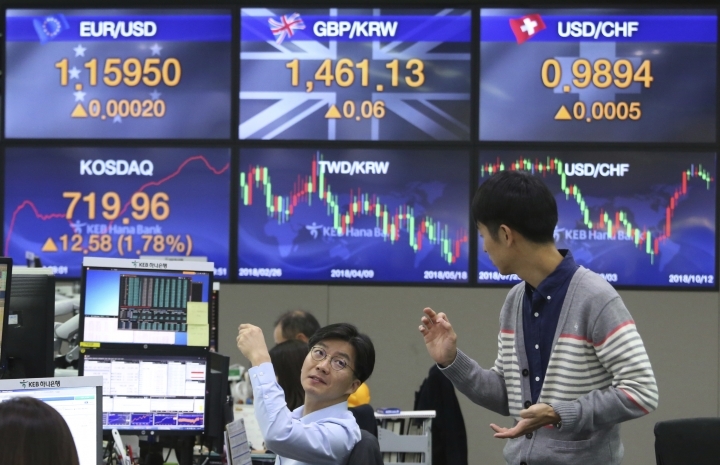 Britain's FTSE 100 was 0.8 percent higher at 7,063. The gains were supported by strong Chinese data. The country's trade surplus with the United States grew to a record $34.1 billion in September, customs data showed. It marked a jump of 13 percent over a year earlier. Chinese exports to the United States increased, although the growth was slower than in August. Imports of U.S. goods grew too, but at a slower pace. Overall, the data was a healthy snapshot in the face of punitive tariffs. Separately, the U.S. Treasury is due to release a currency report that some analysts suggest might change the official stance on China's exchange rate policy. Reports that U.S. Treasury Secretary Steven Mnuchin was advised against labeling China as a currency manipulator — a status that could trigger penalties — have also eased tensions, Innes said. Japan's Nikkei 225 index gained 0.5 percent to 22,694.66 after sinking early in the day and following a nearly 4 percent loss on Thursday. Australia's S&P ASX 200 rose 0.2 percent to 5,895.70. 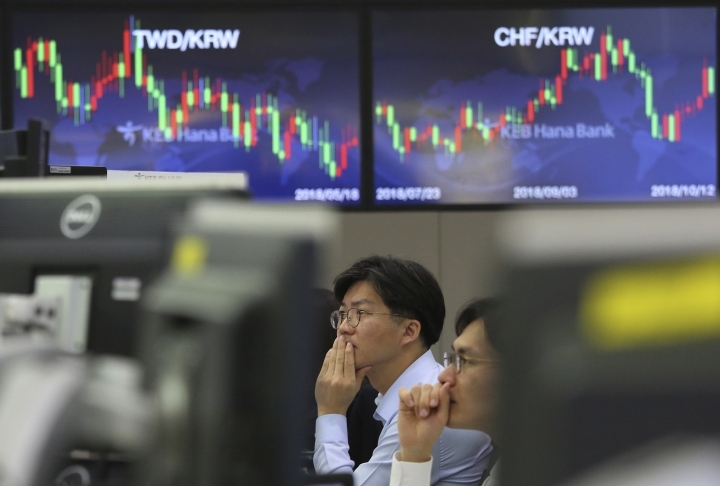 "It seems Asia has had a reassessment, and calmer heads have prevailed as we close out the week," Chris Weston of Pepperstone Group Ltd. said. Officials at the IMF-World Bank annual meeting, held on the Indonesian island of Bali this week, have called on the U.S. and China to work out their dispute over technology while abiding by world trade rules. On Friday, Indonesian President Joko "Jokowi" Widodo compared the tensions to the popular TV series "Game of Thrones." He said fighting among the "great houses" was distracting them from the threat of an "evil winter." "Victory or defeat in wars always brings the same result — destruction," he said. Wall Street was set for an optimistic open after two days of steep losses. S&P 500 futures gained 1 percent to 2,774. Dow futures rose 0.9 percent to 25,419. Around 10 percent of the companies on the broader S&P 500 index, including Citibank, J.P. Morgan and Wells Fargo, will report their third quarter performances soon, which could tip sentiment either way. In other trading, U.S. crude oil added 62 cents to $71.59. The contract dropped 3 percent to close at $70.97 in New York. Brent crude, the international standard, was up 44 cents at $80.70. It dropped 3.4 percent to $80.26 in London. The dollar strengthened to 112.28 yen from 112.13 yen late Thursday. The euro edged down to $1.1584 from $1.1586.